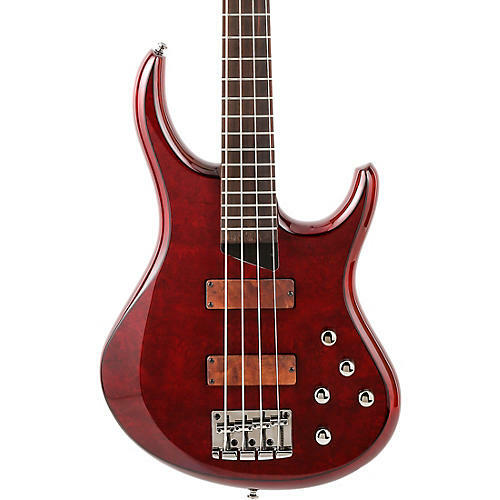 The MTD Z Series of basses is one of their most popular lines. The series was created for the discerning player that wants the great MTD sound coupled with exceptional beauty. As with all the other Kingston basses, it incorporates many of the superior design elements found on Mike Tobias’ revered American series instruments. 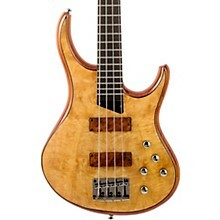 It also captures the look of a handmade, boutique-style bass. Carefully constructed using a high quality Mahogany core and beautifully adorned with a Burled Maple top, the Z basses marry beauty with unparalleled performance. 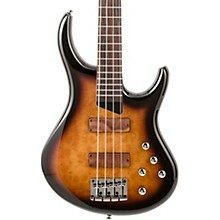 The Kingston Z series is available in 4, 5 and 6-string models as well as fretless and left handed versions. It has a carved mahogany body which has a rich voice and a darker overtone. The maple burl top helps to focus the low end and is incredibly attractive. The two MTD proprietary passive soapbar pickups are wood covered and subtlety reinforce the wood beauty of the maple burl body top. The headstock matches the beauty of the body and the elegantly designed asymmetrical neck ties it all together. Case sold separately.